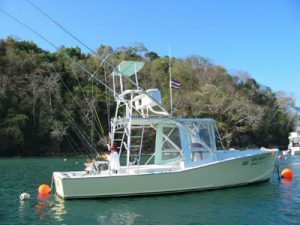 This 31ft Gamefisher powered by twin 250HP Cummins diesels fishes out of Flamingo (Garza and Carillo in January/March) for those who want the very best. Captain Chepe, one of the North Pacific coast’s best-known captains, is at the helm. It has state-of-the art electronics, custom 6 to 80# Penn International conventional tournament-quality tackle, spinning and fly gear, fly fishing and light tackle, and a professional fighting chair. She will also go to Nicoya Peninsula destinations and Papagayo Marina on request.